Conventional card holders are not recommended within hygienic production environments such as food or pharmaceutical manufacture. Fortunately, the UK’s leading manufacturer of stainless steel furniture and equipment, Teknomek, is offering 304 grade stainless steel card holders which are specifically designed for these types of applications. The inherent design and materials used for card holders encourages the harbouring of bacterial contamination both on the surface and within crevices and joints. However, Teknomek’s holders are laser cut and folded from a single piece of steel to maintain their hygienic integrity – this also makes them easy to clean and disinfect. The stainless steel holders are available as single or multiple units in both portrait and landscape versions. 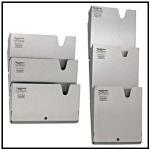 In addition to stainless steel document holders, Teknomek also offers a hygienic room design service. The company has years of experience which has been improved and maximised through the addition of a dedicated 3D design department. This allows the design team to work with customers from the initial design concept, through to the manufacturing process. The stainless steel manufacturer offers advice on how to achieve the most efficient and cost-effective layout. Teknomek also offers a complete costed 3D rendering of the final design so the customer can actually see what the finished result will look like. This approach removes the possibility of project delays and last minute costs due to modifications to get the units to fit the space.